Are you the type of person who hides in the background of a group photo because you're embarrassed to smile? You’re not alone. Even if you take care of your teeth with brushing and flossing, you could still have crooked teeth and a less than ideal bite. As we get older, our teeth tend to bunch together which can make anyone want to keep their smiles hidden. The good news is that there are plenty of options for teeth straightening. It's not just about utilizing the various types of braces offered at Kapadia Orthodontics but considering all your options. Since they first came onto the market, invisible aligners have quickly become the most popular types of braces used by teens and adults. Invisalign trays are worn up to twenty-two hours a day and are custom fit to each patient. Some patients prefer the Invisalign option because the aligners can be removed during meals and are easy to keep clean. Plus, they aren't always noticeable! Sometimes a person can experience multiple teeth erupting all at once when there isn't enough space to accommodate them. When this occurs, a dentist can suggest extracting baby teeth to make room for the adult teeth. Wisdom teeth can also be extracted to make room for the new teeth or placement of different types of braces. Over the years, veneers have gotten a bad rap mainly due to improper use. Today, improvements have been made in design and procedures to provide a better look and fit for this type of teeth straightening option. Veneers are actually thin strips of porcelain that are adhered to existing teeth, matching in color to seamlessly blend in with all the teeth. The only caution to note is that veneers will often need to be replaced every several years and are more prone to cracking. 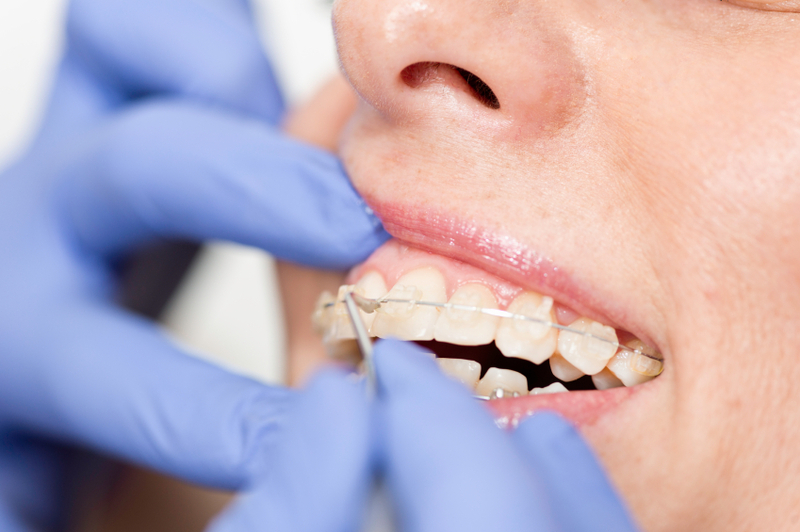 Of course, metal braces still exist as a viable option for teeth straightening and can be placed at any age. In contrast to metal braces, there are choices such as clear braces made from ceramic material. These aren't as noticeable as the traditional metal braces. Braces are usually kept in the mouth for up to two years and there will need to be ongoing adjustments made as the teeth begin to realign. Special care has to be given with regard to certain types of food. In other words, you might have to cut out the caramel, chewing gum, and other substances that could damage the braces. After reviewing all your options, you might want to find out how braces work. The best course of action would be to set up a consultation with Dr. Ajay Kapadia at Kapadia Orthodontics. He'll be able to review the pros and cons for all kinds of teeth straightening procedures and the various types of braces.